November 29, 2008 -- In October, a three-member delegation of Australian trade unionists visited the Saharawi (Western Saharan) refugee camps in the Hamada desert, south-west Algeria. Western Sahara has been illegally occupied by Morocco since 1975.Green Left Weekly/Links’ Margarita Windisch spoke with Sid’Ahmed Tayeb, the minister of public health for the exiled Saharawi Arab Democratic Republic, when she visited the 27 February refugee camp. 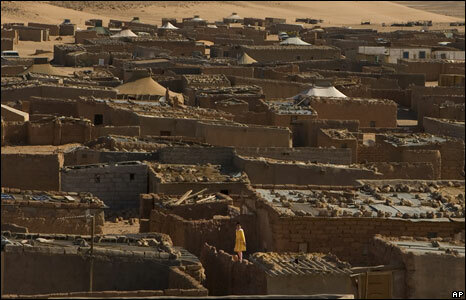 The Saharawi refugee camps have now existed for close to 33 years in extremely inhumane surroundings. What has led to the Saharawis becoming refugees and what are the challenges facing the Saharawi people? First, I would like to thank you very much for your visit. It shows us that we are not alone. This is important support that international community can give us. All along, the Saharawi community has been conscious of its historic responsibility and the sacrifice it has made and still has to make in its fight for national sovereignty. Our sacrifices have been necessary to preserve the history of our people and liberate our territories from Moroccan occupation. Western Sahara was invaded in 1975, by a monarch who needed to stabilise his throne and expand his territory. Living as refugees is a disgrace and is marked by scarcity — in all senses of the word. The biggest impact of displacement is on health. During the first years after the Moroccan invasion, we not only lost many lives during the resistance war but we also had to come to terms with moving away from our natural habitat. We were overwrought with a lack of perspective on how to survive in this new environment, a very hard geographic space without natural life — no vegetation or animals. We have had no experience in how to live in such inhumane conditions. We had many deaths in the camps from 1975 to 1983 that were related to the difficulty of adapting psychologically and physiologically to a radically different and highly stressful terrain. To resolve this critical problem we needed to employ all the material resources available to us. In the face of massive adversity, the main moral, political and sociological task of Saharawi society was to draw strength from the little available to restructure itself and mature against all odds. And I can confidently say that we managed this task with excellence. When we started to organise the Saharawi state in the camps, we were conscious that health is one of the main vulnerabilities. That’s why especially the first years of restructuring in the camps, one fifth of Saharawis were employed in the health field, focusing on prevention. Health prevention today is still one our main political tools. We started with the promotion of health issues in all its aspects initially, because the only thing we had available at that time was human resources. Our society, which was predominantly Bedouin and nomadic, had to undergo a brutal change once we arrived at the camps. People had to settle and face unhealthy dietary change. However, due to our strategy of health prevention, we managed to make some important improvements rather quickly. Humans never know their capabilities until they reach a point were problems have to be confronted; as much on an individual as a societal level. Saharawi Bedouins’ life is very tough, but they still like this kind of life. A Saharawi is not very interested in comfort, such as sofas or television. These are not big attractions. The Bedouin adores nature and appreciates coexistence with his animals, like the camels. We are close to our animals, because they are our means of subsistence. Our society needed a total reorganisation. We had to create administrations in order to manage every district and municipality of the camps according to their specific necessities. We decided to prioritise schooling and community health clinics over individual family needs. Sometimes we had three to four families share one tent so there was a tent for each school and clinic available. Saharawis have had to live for over 30 years on emergency food aid. How are you dealing with the consequences? The characteristic of any refugee camps is health vulnerability, and nutrition is an important part of that. We have achieved some very good results. In more than 20 years we have had no type of disease epidemic, even though we have had to live in drastic climatic circumstances where we face massive temperature changes from a high of 58°C in summer to -6°C in winter. On top of this, our diet is hyper glutei — made up of 95% of carbohydrates — because it is the cheapest and easiest accessible form of aid available for the camps. This diet is highly deficient for our immune system. It also creates a different human organism to normal. Women and men are born into this state of scarcity — which is impacting especially on the mother but also the child. We not only develop general health programs, but also diagnostic programs that look at the health risks and causes. We create workshops with all the Saharawi health professionals, and our specialist friends and sympathisers, to arrive at a good scientific diagnosis. At the moment we are working with Norwegian health professionals on a four-day nutrition seminar. We identified this as a priority because in February we did a nutritional study that looked at levels of anemia and malnutrition, especially in the most vulnerable sectors; women of childbearing age and children under 15. We found alarmingly high levels of anemia and malnutrition. These findings compelled all of us involved in health to get together and develop a realistic diagnosis and find realistic solutions. Our problems will persist as long as we are refugees. However, the only way to minimise the impact is for us to unite our strengths, make the situation as dignified as possible and apply all our knowledge. What benefits does the high level of Saharawi control and organisation in the camps bring? Saharawi people live a precarious existence; we are in a place of being or not being. We have only two choices — a sovereign Saharawi state or total dispersion of Saharawis across the world, without a homeland, memories and no responsibility for the future. We are conscious of this responsibility for our society in its totality; we have to organise ourselves in order to survive. We have to develop the level of organisation in order to meet the challenges coming our way every minute. We have now lived for quite a few years with neither peace nor war, since the 1991 ceasefire with Morocco. When we were engaged in war, the perspectives were clear, even though we didn’t know how many lives our resistance struggle would cost us. We were engaged in armed combat in very unequal conditions with a militarily superior Morocco. It was not only Saharawi society that paid a big price for the caprices of the Moroccan king. Moroccan soldiers were also victims of his Machiavellian mind; they, their families and Moroccan society in fact have paid dearly for the king’s expansionist ambitions. We noticed an encouraging high participation of women at the recent General Workers’ Union of Saguia el-Hamra and Rio de Oro (Western Saharan trade union organisation) congress, but also more generally women are very visible in public life in the camps. Our society is a very naturalist society. We share our responsibilities in a collective manner, which includes extended families along ancestral lines. Because of our ways of life, women occupy a critical rank. In a nomadic society, the woman is everything. The man of the family is itinerate; he is either looking for pastures or is at the markets hundreds of kilometres away and may be absent for weeks. Once we arrived at our refuge in South West Algeria, women organised the state and constructed the institutions, from the smallest to the biggest. Women have also been combatants during the years of war. In incredibly harsh conditions, women were both the backbone of the camps and the revolution. In Saharawi society, women are not discriminated against because of their specific physiological make up. Cuba has educated many Saharawi children. Why is this the case? Cuba, such a small country with minimal material resources, has extended humanitarian help to many countries. Most importantly, Cubans have helped with education and health. The Saharawi people are one of those peoples that are eternally grateful to the Cuban people. Only Cuba, on the other side of the word, opened the doors for us and took our kids to educate them into doctors, engineers, lawyers and technicians of all types. Cuba has also helped with medical support. In 1976, we only had four qualified nurses — a consequence of more then 100 years of Spanish colonial rule. So imagine, in times of war and an extreme refugee situation, we had to make do with only four nurses to try and deal with our health problems! Now, the leaders, functionaries and youth you see working in the camps are all a result of the support and education provided by Cuba. Cuba, with the little they have, still shares with others, independently of their obligations in their geographical region, culture, religion or skin colour. We Saharawis are conscious that it was Cuba that has helped us to walk on our own two feet since the Moroccan invasion. Western Sahara is Africa’s last colony and the conflict is still unresolved. How can we best give our solidarity to Saharawi people? There is only one solution to our existence as refugees: our return to our sovereign homeland. There is no other solution. I can only mention the need to unite all our societies along the lines of peace and true justice. It is this unity, not aggression, that we need so all of us can enjoy happiness instead of destitution and humiliation.